Yesterday it was sunny, in the upper 70s, with a 40 mph wind! Today it partly sunny, upper 30s and a stiff wind. Not looking like sun bathing days in store for us over the next 6-7 days. Great past four days of very little generation. Today, of course, is another day and we have seen generation all day. Tomorrow’s projection is more of the same….generation all day. Should be one unit mid day, but back to 2 units by evening. 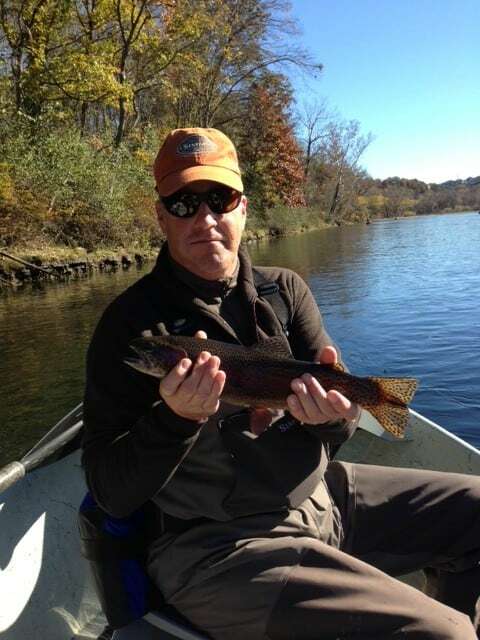 Jim on the water last Monday with Rob and Bruce from Illinois. 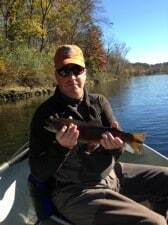 Fairly tough day and the guys are pretty new to fly fishing. Caught some fish on the white grub, brown San Juan worm and ruby midge. Stan had Bryan and Vanessa from Kansas out for 1/2 a day. 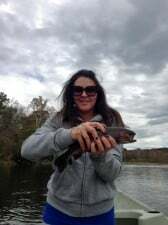 This was Vanessa’s first time with a fly rod and she did well. They caught fish on the P&P, copper dun and big ruby midges. really good day on the P&P or black copper headed midge under the big ruby. 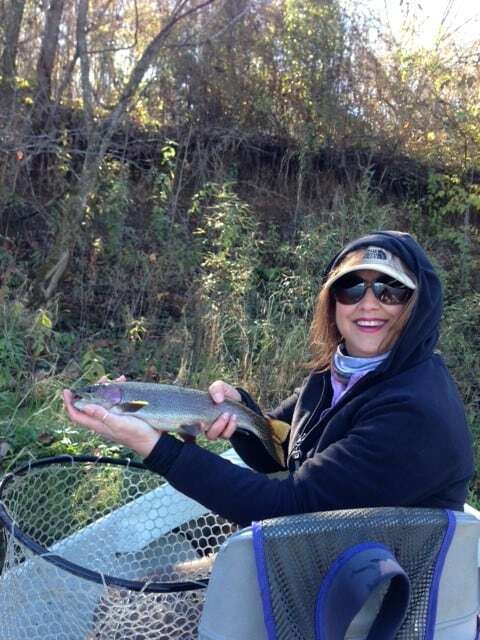 The River Runners Women’s Fly Fishing Club came in Friday. Some got here early enough to fish a little Friday, but everyone was here to fish Saturday. If you were near the river, you probably heard these ladies. It was a magic day for fishing. Everyone caught several to lots of fish, mainly stripping the holographic green crackleback in the deeper water or stripping the pumpkin crackleback in the shallow water. Also pulled a lot with a small gray scud in the shallows. What a day! Jerry and Sheila from Springfield, fish with Carolyn Sunday morning late. Wanted it to warm up a little. Slow day, but did pull several nice fish on either the pumpkin crackleback in the shallows or a variety of streamer patterns in the deeper water using the sinking leader. Sheila recently hurt her wrist so she wasn’t up to throwing a lot of line. She fished various midges and caught fish on the black zebra and P&P. This entry was posted on Tuesday, November 11th, 2014 at 5:52 pm	and is filed under Fishing Reports. You can follow any responses to this entry through the RSS 2.0 feed. You can leave a response, or trackback from your own site.